ESA’s satellite, XMM-Newton, has recently discovered two giant channels of hot, X-ray emitting material flowing outwards from the Milky Way’s core into two enormous cosmic “bubbles”. 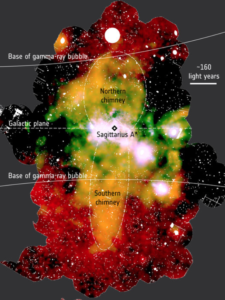 These “bubbles” span about 50000 light years above and below the plane of our Galaxy and they were discovered by NASA’s Fermi Gamma-ray Space Telescope in 2010. According to scientists these channels act as exhaust pipes through which energy and mass are transported from Milky Way’s core out to the base of the bubbles, replenishing them with “fresh” material. This mechanism could also explain the existence of large structures that surround the core of our Galaxy. The outflow is either a remnant of the energetic past of the Milky Way or it may prove that even non-active supermassive black holes can emit large amounts of material. Dr. Ponti, lead author of the relevant study, said: “We know that outflows and winds of material and energy emanating from a galaxy are crucial in sculpting and altering that galaxy’s shape over time – they are key players in how galaxies and other structures form and evolve throughout the cosmos”.